“Why did you start a blog?” is a question I’m asked a lot. While in law school, I knew it wasn’t a perfect fit for me. Maybe it was the blonde hair and New England superiority, but I also know I gave off the impression that I did not want to work 80 hours a week. I had other interests – cooking, decorating, I don’t know, smiling (I’m not bitter at all, you all enjoy those 14-hour work days). Blogging was a creative outlet for me, but it turned into much more. I started to read more blogs being written by other women, blogs that were open and honest and raw and got me through tough times like post-partum depression, divorce, and being a new mom. I started to realize the power that I had to help others. There’s so much legal information that is helpful to me. Information about starting and running a business, buying a home or getting married. And I don’t think it’s fair to anyone to only show the pretty stuff – so I try to share my own challenges with the hope that my struggles and successes will inspire others. I love sharing the stories every month of Ladies in Business who are following their passion and controlling their own schedules. Blogging can also be a great way to avoid that 9-5 (or 9-9 grind). Influencer marketing (when brands pay bloggers to promote their products) is only becoming more popular. It’s good for brands and influencers. Brands have the opportunity to reach a targeted audience while spending a fraction of a traditional advertising budget. It also provides an opportunity to normal people with substantial social media followings to be compensated for their promotional posts. Of course, there’s other ways to make money blogging – like affiliate marketing, ads, selling a product or e-course, etc. 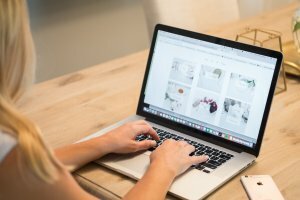 So if have your sights on being your own boss, while working from the couch, blogging may not be a bad choice for you. Check out my pinterest board on blogging for some resources on getting started. 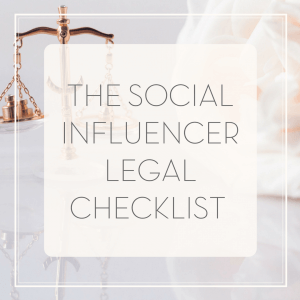 Of course, influencer marketing has its own legal issues. From what to include in a contract with a brand, to following Federal Trade Commission and Instagram rules on advertising, there’s a lot to learn. I’ve put together a handy dandy little guide for you if you want to learn more! I actually really enjoy practicing law, and still do practice. Sorry to all of my law school classmates for making you lose that bet.